Having a Balinese blood gives me the advantages of visiting Bali so often since I was a kid. I could say there is no place in Bali that I haven’t visited. Now I am sitting in the airport waiting for my flight back to Jakarta while laughing to myself because this article is going to be my first tips and trick articles about my homeland Bali. It suddenly inspired me as recently my foreigner friends came to Bali and asked me to accompany and show the beauty of Bali from the local sight to them. 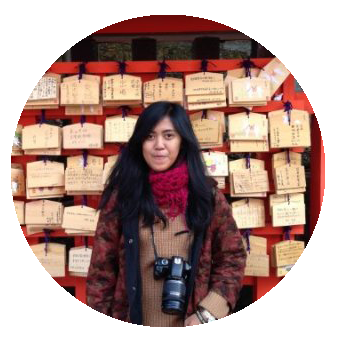 That’s the moment I thought to make an article about Bali starting from Ubud since this is my favorite area in Bali. This is an official taxi owned by Airport Management, they already have the price list instead of using the meter. These cars are private own, They don’t use the meter and don’t have exact rate. So, you would be free to ask for bargain. Meanwhile, my suggestion price is not more than Rp. 300.000. Capacity of one car not more than 4 people as you have to spare for luggage space also. I highly recommend staying in central of ubud as everything would be walking distance. Central Ubud is very small with cafes, restaurants and shops surrounding. So, if you don’t have a plan to hire a transportation, this option would be fit for you. 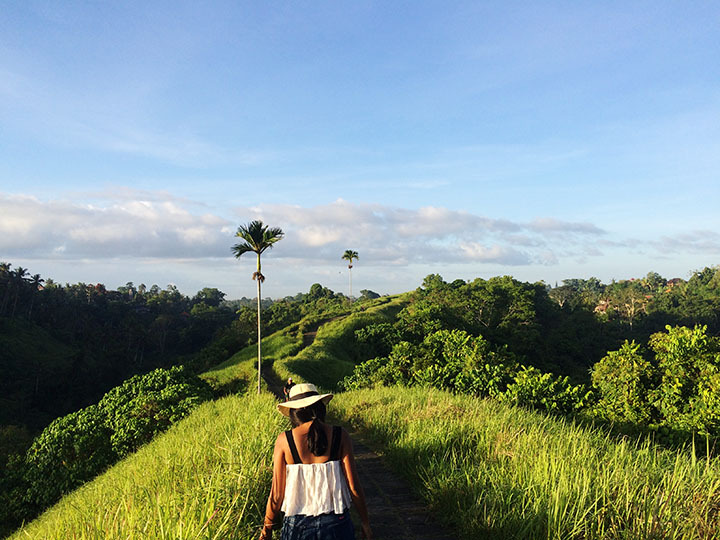 Here I would like to give you 2 options exploring Ubud. 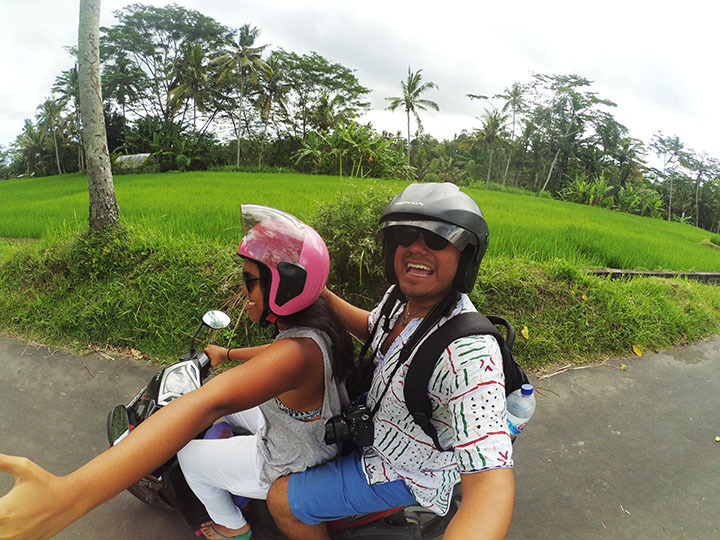 I highly recommend to rent a scooter since Ubud street is so small and busy. Rent scooter cost 60k/24 hours including the helmet. And also we can stop and park right in front of the places. If you go with a group or nobody on your group can ride a scooter, you can choose this option. Rent a car cost around 600k– 750k/24 hours including driver and petrol, capacity max 5 people. The thing why I recommend hire a scooter is finding a parking space for car very not easy ! There’s only one parking park for car and bus and it’s far from the central Ubud which means you need to walk, or ask the drivers to drop you off in place and pick you up afterwards. 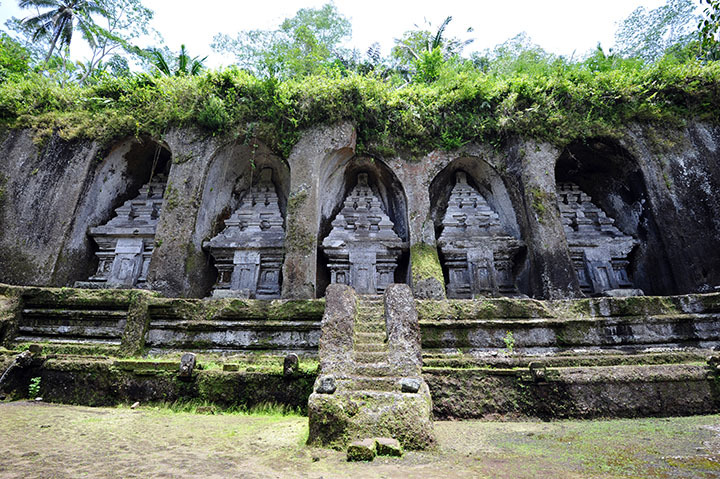 Gunung Kawi Temple is one of the oldest temple built in 11th century. Gunung Kawi Temple consists of 10 rock-cut candi (shrines) – memorials cut out of the rock face in imitation of actual statues. You need to go down for 315 steps and up back for 315 steps. On the way along the steps you’ll be spoiled by a very nice greenery of rice fields and waterfall. Some of my foreigner friends said that showering in Tirta Empul Water Temple is their best experience of Ubud. Only 1 km away from Gunung Kawi Temple, This place is famous by its holy spring water where Balinese Hindu go to ritual purification. The temple pond has a spring which gives out the fresh water. 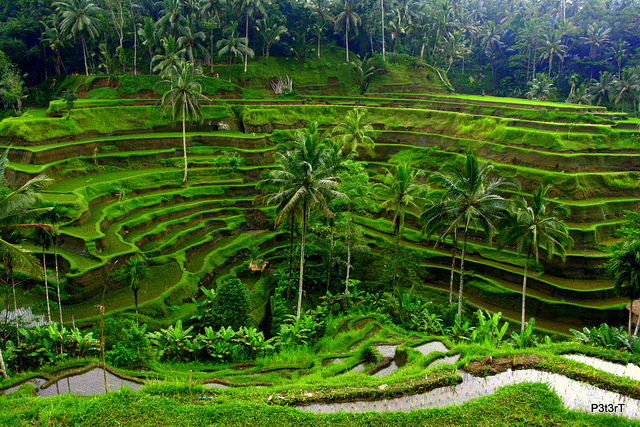 Tegalalang Rice Terrace in Ubud is famous for its beautiful scenes of rice paddies involving the subak (traditional Balinese irrigation system). This place is like a must-visit-place in Ubud. I highly recommend you to depart from Ubud maximum at 08.00 am so you can reach the place within 08.30 and finish before mid day as Tourists usually come at 11.00 am. Moreover, you still could get the morning vibes when coming in the morning. Apart from the touristy Tegalalang Ricefields, I’ve found a beautiful ricefields in Tampak Siring Area. Well it doesn’t has a terrace like Tegalalang has. but the view here is so magnificent. Especially, for Photography Enthusiasts, the landscape is totally awesome. It took around 50 minutes from Ubud Central, but I am not sure I can go to this place by myself again or not since I departed in early morning aroun 04.00 am and I slept in the car during the journey. But anyone interested about this tour, you can get it by click this link. You’ll also be accompanied by the expert photographer on the trip. Monkey Forest is located in central Ubud. The bali architecture combining with the natural forest are the reasons why this place is beautifully unique. Location : Ubud Central (From Ubud traditional market on the corner of Jl monkey forest and jl raya ubud, head towards the bridge. Just before the bridge you’ll see sign to the Warwick IBAH villa, turn into that area. Don’t go inside the villa, there will be a path going down next to the entrance of the villa. Then you’ll see a sign saying “Going to the Hill”.Then you’ll see two paths to cross the river, choose the stairs, follow the path and go right up the stairs, and then just follow the main path to reach the hills. Apart from the most touristy Tegenungan waterfall, Tibumana Waterfall is highly recommended for those who wanting to escape from the tourists and enjoy the peace and tranquility. When I came here there was only 2 people and 3 of us who visited this waterfall. You’ll pass some Balinese regency and forest on the way to Tibumana Waterfall. Located in the north area of Bali, Ubud is very close to the volcano Mount Batur. In one and half hour drive you already can escape from the heat weather of Ubud into the windy weather of highland area. Along the way from Ubud, we’ll pass wooden and craft shop both on the right and left side. 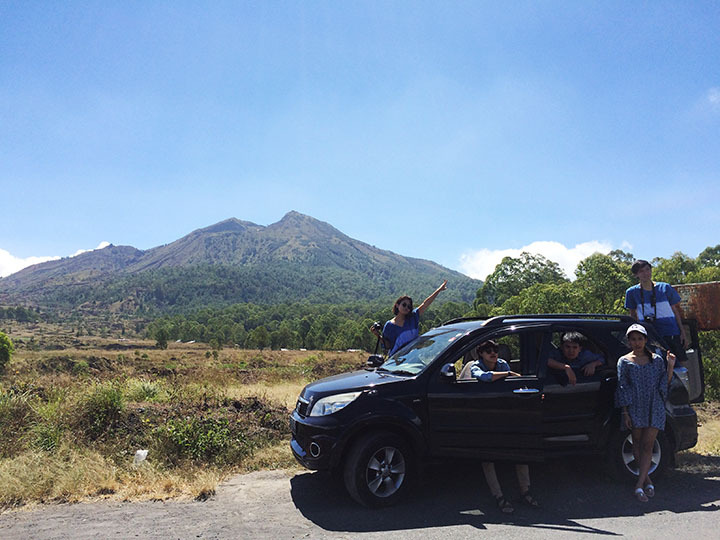 The view of Agung Volcano and Batur Volcano would accompany us during the trip. Make a visit to hot spring in the foot mount batur and lunch with view. Read more about 5 Activities Offer The Best Views of Mount Batur Volcano in Bali by click the link. Ubud is very well known by its craft especially wooden things and artsy stuffs. In central ubud, you can find these things in Ubud Traditional Market. But as my experience, they really sell with high price since the location is pretty touristy. But since the location is really close and walking distance, it’s fair if you want to shop only some souvenirs. Otherwise, if you are planning to shop more, I recommend you to shop at Sukawati Traditional market. This one is bigger and has various collections, also you can still bargain with half price from stuffs that sold in Ubud traditional Market. You can reach Sukawati Market for 30 minutes drive from Ubud Central. 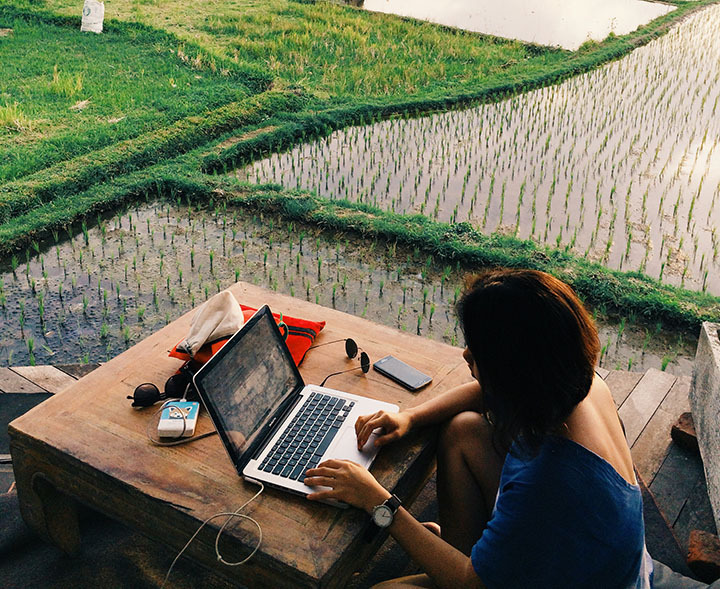 Ubud is not about nature and artsy stuff, but it also famous for hipster cafés and coffee shops. The traditional Balinese Rice and Chicken. The package complete with rice and various chicken with different cooking style. since Bali is the only island in Indonesia that majority of Hindu, you’ll find so many restaurants sell Pork which is rare comparing to other islands in Indonesia which claim Pork is not hallal. Clear café has 3 stories and located next to the river. This café usually be the place of digital nomad to work as the ambience is really chill with a view of river and breeze weather. Foods and beverages are also good ! One most recommended café among travelers. Pomegranate Café located in the middle of ricefields. People usually coming at 03.00 am to enjoy the beautiful sunset scenery in the middle of ricefields. Location : Jl. Subak Sok Wayah, Ubud. Ubud Central (From Ubud traditional market on the corner of Jl monkey forest and jl raya ubud, head towards the bridge. Before the high wall with lush trees, there is a small street going up. Scooter would be able to going up, but car has to stop on the main road as the street is only 2 meter width. Walking from the main road takes 15 minutes, otherwise by scooter it takes 5 minutes. 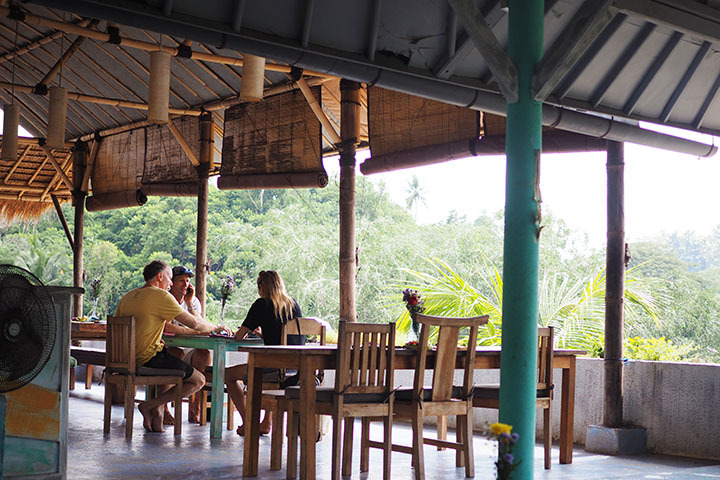 For long-term stay in Ubud, this warung offer a very cheap Indonesian cooking style. There are various menu you can choose. Beat the heat of Ubud with these desert lists. The official store is at jalan sayan, but now you can get this scoop of ice cream in Gaya Gelato small counter at Jalan raya ubud, next to starbucks Ubud. Coconut Ice Cream is basically coming from Thailand. As I tried it with my Thai Friends, they said this one tasted so good. They actually sell homemade jams with fruits flavor, but there is also crepes with choosen jam. If you are not sure what flavor you would put in, don’t worry there are several flavor tester available before you order. Shops in Ubud close at 10.00 pm and most of Bars in Ubud close between 11.00 pm – 12.00 pm. This bar opens until 04.00 am, there always be a live music until midnight. The place is very spacious. There are also 3 billiard pool available to play for free. After 12.00 am the club would be open. Laughing Buddha open until 01.00 am, I honestly never try this bar, but from outside this bar looks so fun with live music. Those are 15 things you should try when visiting Ubud recommended by my Balinese soul. Ubud is very different from other area of Bali such as Seminyak or Kuta. Better you spare your time here at least for 3 days 2 nights. Have you ever visited Ubud, do i miss some places ? you can also share them in the comment below for sure !